With Intel's Core 2 Duo topping all the bench tables, the Athlon has been reduced to a supporting role as a value offering. 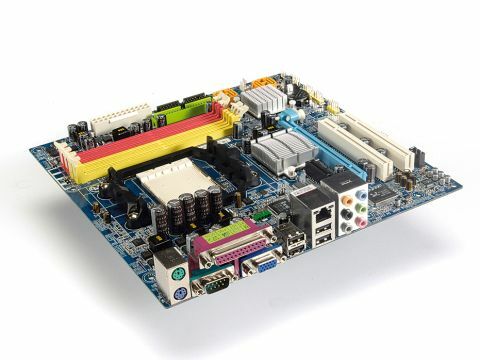 In that context, this distinctly modest AM2 motherboard from Gigabyte makes a lot of sense. At just £35, its pricing is downright dirty. Especially for a board from a major manufacturer like Gigabyte. And just think, you could add a cheap dual-core Athlon and a couple of sticks of budget memory and barely break the £100 barrier. What's more, thanks to the integrated Radeon X1200 graphics, you only need add a hard disk and DVD drive for a cheap dual-core rig. We'll therefore forgive the absence of BIOS ramping options, overlook the lack of digital video out and ignore the mere quartet of SATA ports. If you're on a budget, this proves you can still afford quality.